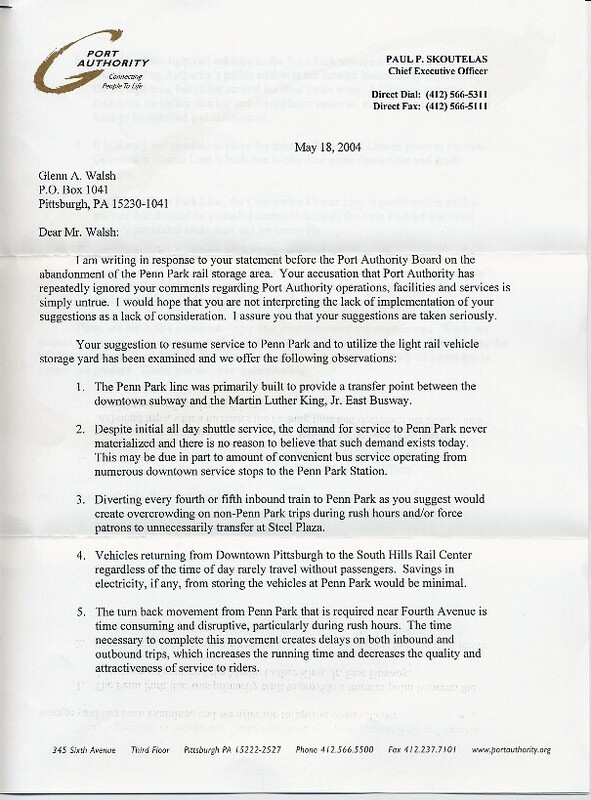 Paul P. Skoutelas, Chief Executive Officer of the Port Authority of Allegheny County mailed a letter to Glenn A. Walsh, on 2004 May 18, in response to Mr. Walsh’s public statement, delivered before the Port Authority Board of Directors on 2004 April 23. Following the April 23 statement, PAT Board Chairman John A. Brooks had told Mr. Walsh that the PAT Board would discuss the details of the statement at the May Board of Directors meeting. This did not happen. Mr. Skoutelas’ letter was the only response received regarding the details of the statement. 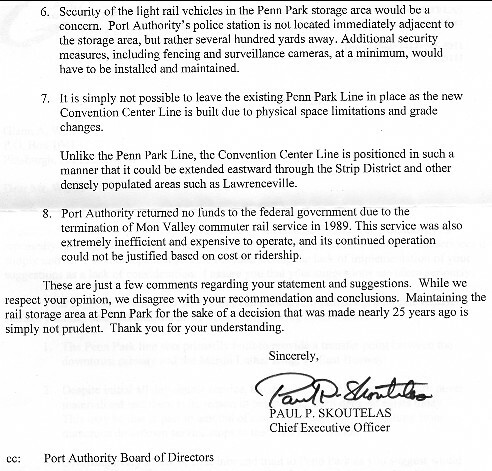 The following rebuttal, to eight points in Mr. Skoutelas’ letter, would have been delivered before the Port Authority Board. However, due to a loophole in the Pennsylvania Sunshine Act, Mr. Walsh was forbidden to address the PAT Board, again, on this issue. Rebuttal: When one builds a $2 million rail car storage yard, which cost as much, if not more than, the light rail passenger station, one must concede that there were two major reasons for building the rail line to Penn Station: (1) passenger connections between light rail trains and buses; (2) mid-day storage of light rail cars. Of course, in addition to people having easy connections between light rail trains and buses at the light rail station at Penn Station, this also allowed easy connections for people transferring from light rail trains and East Busway buses to Amtrak trains, Greyhound buses, other bus carriers which serve the suburban counties, and the possible future commuter rail service into Penn Station [such as the proposed Allegheny Valley commuter rail line]. P.S. The “Penn Park” name is a hold-over from the Early Action Program in the 1960s, when the Pennsylvania Railroad planned construction of a major office-retail-residential complex, on their land holdings in the Strip District, which they called "Penn Park." Regrettably, their plans also called for the demolition of Pittsburgh’s Pennsylvania Railroad Station building [as they did in New York City]; a new “modern” rail passenger station would be built to replace the current rail passenger station. This complex was also going to include a new Main Post Office at 25th Street. The bankruptcy of the Penn-Central Corporation brought an end to this development proposal. Eventually, a large new Post Office was built on the North Side, rather than at the Strip District site. Of course, the “Penn Station” name is used in Pittsburgh [as it is also used in other cities such as New York City, Newark, and Baltimore] as an abbreviated version of the long-time name of the railroad station: Pennsylvania Station. Actually, when the present railroad station terminal was built in 1902, it was called “Union Station,” as it served as a common union point for several different railroad companies. However, in this case, all of these railroad companies were subsidiaries of the Pennsylvania Railroad. So, eventually, they were all consolidated into the Pennsylvania Railroad; hence, the name “Union Station” fell by the wayside and Pennsylvania Station or “Penn Station” became commonplace. In the case of the Port Authority, they have used both the “Penn Park” and “Penn Station” names for this site, while building the Martin Luther King, Jr. East Busway and Stage I of the Light Rail Transit system, respectively. Rebuttal: As this shuttle was always a free service, as it operated completely within the free zone, PAT had little incentive to market or promote this service. Hence, very little promotion for this run was provided. A lot of people did not know then, and to this day do not know, that there is a light rail station at Penn Station [which still has two roundtrips during the afternoon rush hours on weekdays]. Despite these problems, there was some use of this shuttle. In fact, my own sister, who lived in Dormont at the time, used the shuttle to connect to the East Busway, for her daily roundtrip to a business near the Negley Avenue Busway Station! Rebuttal: Each fourth or fifth car would still serve light rail stations at Station Square, First Avenue, and Penn Station, in addition to Steel Plaza. Once the Convention Center Subway Station is completed, this fourth or fifth train could also serve the Convention Center Station, before going to Penn Station and the rail yard. Some people who normally use the Wood Street Subway Station could be equally served by the Steel Plaza, Penn Station or Convention Center rail stations. Likewise, there are some people who use the Gateway Center Subway Station who could use the First Avenue Station. By far, during the rush hours, Steel Plaza is the number one commuter destination in the morning. Therefore, this fourth or fifth train would bypass only two Downtown stations. The vast majority of trains entering the city would still serve the Gateway Center and Wood Street subway stations. Rebuttal: That is a function of being a rapid transit line in a corridor where a lot of people use public transit. However, the number of passengers riding contra-flow of the rush hour flow is minimal. Without this additional service, there would still be plenty of service for these riders to use. Savings of electricity, over the last twenty years, would not be minimal. Such savings could help the Port Authority avoid future rate increases or service cuts. Rebuttal: You state this as fact, yet the test of such a system has never been made. The designers of the rail yard would have known that this would not be an easy movement. However, they went ahead and spent the $2 million to build the rail yard anyway; obviously, they thought this track movement could be accomplished without major disruptions. And, since this system has never been tested, you have no evidence to say they were wrong. Rebuttal: Of course all necessary security measures would have to be taken. I am sure that the designers of the rail yard knew this, and they expected that the Port Authority would do so without major problems. However, the proximity of the PAT Police Station is valuable to the security of this rail yard. And, the third floor of the PAT Police Station does have a lookout-tower [remember, this was formerly a lookout-tower for the Pennsylvania Railroad’s large rail yard] that juts-out from the structure, which allows the police to directly watch the rail yard. Rebuttal: It is not possible simply because your planners have planned the new subway line in such a way to ensure that the Penn Station rail line is cut-off, so you can eliminate a $2 million embarrassment that you chose not to use. Penn Station and Steel Plaza are roughly at the same grade; there is absolutely no reason that some type of rail connection could not be maintained to the current light rail passenger station at Penn Station and the mid-day rail car storage yard from Steel Plaza, even with the construction of a below-grade subway line to the Convention Center. Rebuttal: When PAT decided to terminate the PATrain to the Monongahela Valley, PAT Executive Director Bill Millar told the PAT Board of Directors that this would require the partial reimbursement, to the Federal Government, of funds used to build the new passenger rail stations in the Mon Valley and purchase rehabilitated rail passenger coaches, as these rail stations and rehabilitated coaches were only a few years old. If PAT did not reimburse funds to the Federal Government, I suspect it was due to intervention by the Western Pennsylvania Congressional Delegation, at that time. The PATrain had financial problems, which were not helped by a PAT management that had no interest in the service, and made certain decisions that made the PATrain operation look worse than it had to be. Almost exactly ten years prior to the termination of the PATrain, I had made a proposal at a PAT public hearing in McKeesport to reroute the PATrain to Pittsburgh’s Penn Station. Not only would such a rerouting have placed the Downtown PATrain Terminal closer to the center of the Pittsburgh Central Business District, but this would also have allowed the creation of a new PATrain station in Oakland, the third largest traffic generator in the Commonwealth [behind Philadelphia’s Center City and Pittsburgh’s Golden Triangle, respectively]. Such a rerouting would have attracted new ridership to the PATrain, which would have improved the commuter line’s financial performance. However, PAT did not want to improve the PATrain’s financial performance, since that would mean that PAT would have to keep operating the PATrain. So, PAT killed the PATrain just before such a rerouting could take place [and, such a rerouting would have had to take place within two or three years of the 1989 termination of the PATrain, as the Baltimore and Ohio rail property was about to be sold].